Skate Moore Skate Center in Moore, OK may just be the new hot spot of the summer. Our indoor facility offers our clients many different opportunities no matter what you are looking to experience. 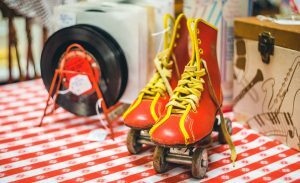 Our list today provides you with three different reasons why roller-skating at Skate Moore is the PERFECT summer activity! At Skate Moore Skate Center, we are dedicated to teaching our clients the different health benefits of roller-skating. If you have ever skated before, you know that it works different muscle groups than normal and often leaves you tired. By visiting our website, you will see the different health benefits and can find out how to get involved! While we like to focus on health benefits, we also like to focus on parties and having fun! Roller-skating is a great way for you to have fun with all of your friends. There are many different games you can play while skating that are sure to highlight your summer. We know what you’re thinking. It is WAY too hot during the summer to go roller-skating. Don’t worry. We have you covered. Literally! By a roof! That’s right, we offer air-conditioned roller-skating, which makes it the perfect summer activity. You can finally get out of the sun and away from those harmful UV rays. No more greasy sunscreen lathered onto your skin. Just fun with all of your friends at Skate Moore! We hope to see you at Skate Moore Skate Center all summer long for your best summer vacation yet.